They're both using stamps from the Magnolia Spring stamp club and coloured in with Prismas - anyway here's my rather loose interpretation of green! This first ATC inspired the second one - I love the wee watering can! I seem to be perpetually behind when it comes to the challenges over on the Tilda ATC challenge blog - without realising I'm now 4 weeks behind! I really need to get a card made for my Dad as it's his birthday next week and he's off to France with Mum for a couple of weeks - instead of getting on with it I managed to get a couple of the challenges done. The first ATC was for the 'Going Dotty' theme - totally uninspired for this one, I was going to use my Swiss Dots cuttlebug embossing folder but completely forgot! I used some dotty/spotty paper from a previous Gogo kit and one of the new Tilda's from the Spring Stamp club. The second one is for this weeks challenge, Bugs! I didn't have a clue what to do for this one - I was going to use the ladybug stamps I have from Cuddly Buddly but then I remembered I have the Magnolia butterflies. I stamped the grass - another Cuddly Buddly stamp - along the bottom, then used the 2 cloud stamps from the Spring Stamp club & coloured then in with Siam White Twinkling H2o, coloured the sky with a Prisma 'sky blue light' pencil, stamped the butterflies and added 'bug' using my ATB tape writer. Here's my card - it's a Breast Cancer charity Tilda colored in with with my Prisma's, Basic Grey 'Phoebe' papers (I only have about 5 sheets of the 6x6 pad left! ), random piece of grosgrain ribbon and my attempt at snipping off the corners in a concave fashion! One of my fabby SBS 14 Sistahs has sent me a ticket corner punch from over the pond and I can't wait for it to turn up! My shopping trip yesterday was good - I finally spent my Accessorize voucher and got these two lush bags! The one in the second pic is going to be my new book bag - the one I made finally gave up last week when the stitching all came apart! Anyway, in case you all leave here's a card! 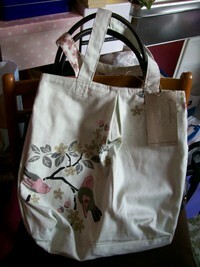 This one of the Tildas that Magnolia sell to raise funds for breast cancer research - I think she's gorgeous! Papers are Basic Grey 'Phoebe', flower from Rebecca, button is BG 'Two Scoops' and the ribbon was a random piece I found in one of my ribbon boxes! Off to bed now as we're hopefully off to Whitby tomorrow if the weather is good - if not we're going to the Designer Outlet Centre for more shopping! What an exciting day here! It's been horribly mundane as my parents arrive tomorrow to stay for the week! I've been dusting, hoovering, ironing and doing laundry so the house looks halfway decent - I think the only way that'll happen is if someone knocks the place down and starts again! I still need to clean the bathroom and hang the new curtains in my scrap room - it's doubling as a bedroom (with a blow-up mattress) for the week so not going to get much done this week. Totally worth it though as it'll be fab to see M & D and I get to go shopping, hopefully for a new computer! Anyway, here's one of the cards I made over the last couple of days! It's loosely based on the latest SCS sketch challenge - I messed it up in my usual inimitable way! Lol! I used Tilda with ice cream colored in with Prismacolor pencils, Basic Grey 'Cupcake' papers - when I first got the pad I wondered what on earth I was going to do with the ice cream paper but now I know the answer, buy a stamp that has ice cream! The red card is Stampin' Up! Real Red, the flower and those teeny weeny glass marbles (that get everywhere!) are from Rebecca and the sentiment is Penny Black :) I might have another go at this card but change things round a bit. My new goodies today were all stamps - 4 more Tildas from Sir Stampalot bringing my grand total of Magnolia stamps up to 35, the 3 new Lola stamps by Rachelle Anne Miller at Funky Kits - looks like Lola's Tea Party & Teddy Two are out of stock & the wee kit with Penelope in is gone completely! I also snuck in another Bella with my FK kit - Cuppacakeabella, one of my favourites so far! I'm selling some more books on that auction site this week so hopefully I'll make enough pennies to treat myself to a couple more soon! Or I might treat myself to a Cricut cart :) Off to bed to read as H is watching Dragnet for the 999th time - I kid you not! Anyway, this was a challenge from Papertake by Claudia - I'd seen these gorgeous boxes on a couple of blogs so finally got round to clicking on the link to have a look at the challenge! I had a go this afternoon and here is my finished box - by the time I'd finished it off we had brilliant sunshine! Crazy British weather! I was a bit nervous about having a go as I'm hopeless at doing things like that but I think it turned out pretty good for my first attempt. I'm going to keep all my Magnolia stamped images in the box as at the moment I have them stored in a 12x12 baggie! Papers are from Love, Elsie 'Betty', the chipboard hearts are covered with more 'Betty' paper, a random piece of ribbon and Tilda wearing heart dress - my favourite stamp which I now own and is wending its way to me! Yes, we got some but no, it didn't settle :( Obviously the snow was storing itself up from yesterday as we had 3 or 4 rather heavy blizzards - shame it was too wet to settle but I'm also quite glad as I'm at the hospital again and wouldn't that have just been so much fun getting there! Amanda, he most certainly still does have it! I loved the show (and Mr Tennant!) so much I had to watch it again this morning along with the last 2 episodes of Torchwood. Oh my! Why couldn't someone have warned me I would need the hankies out?! And just look at this fab pic of DT I found earlier this evening! Anyway, moving on from my David Tennant/Doctor Who/Torchwood obsession here's today's card! Magnolia 'Love Tilda' colored in with Prisma's, Basic Grey 'Cupcake' papers, ribbon from a Little Silver Hat kit and stamp by Aud! It's been a lovely day here - snow was forecast up on the moors so was expecting it to be really cold but we had gorgeous, bright sunshine nearly all day! I was in the sandpit all afternoon just about - lots of good tv tonight - but didn't really get much done. I finally used one of my precious hAnglar & stAnglar images that I received from Charlie as part of a blog candy prize. I think I still have 5 images left but I'll be hoarding them until I get my mitts on some of the stamps - hopefully that will be quite soon thanks to a lovely fellow Stash Dieter! Here's 2 of the 3 ATC's I did yesterday - now completely up to date with the challenges over on the Tilda & Friends ATC blog! I showed H the 3rd one and he agreed it was dreadful so it's now in pieces in the bin. First challenge was to use yellow and blue - this is Farmer Tilda colored in with Prisma's, background paper is from the Papermania Retro Floral paper pack and the yellow ribbon is from this month's Scrapagogo Create kit. The second ATC was to fit the challenge of using checks - this is another of my favourite Tilda's but I don't have the stamp, just a couple of images which I've now used :( Both the checked paper and the plain green peeping out at either end are Basic Grey Two Scoops along with a BG Two Scoops button. I didn't realise I was so far behind with the challenges over on the Tilda & friends ATC challenge blog - 3 weeks!!! I'd missed out on Chocolate, Blue & Yellow and Checks - I managed to get all 3 done tonight but one of the ATC's, Chocolate, will never be seen by another living human being as it's decidedly carp! I'll put the other 2 on here tomorrow! Today's card - yet another of my favorite Tilda stamps, Tilda with hat! Papers are Basic Grey 'Two Scoops' again, ribbon is from Making Memories and round sentiment is, again, from Aud. Found another excellent book challenge today - unfortunately it means I'll have to buy some more new books as I can't find a couple on my list anywhere. Cybercrop madness continues - actually did one of the pre-crop challenges today and made a 'keep out' door hanger for my scrap room! I've been really good and not bought any kits at all, not even the mystery kit! It's 5p listing day over on that auction site so I've spent literally all day listing books! I've got 50 that I want to part with - rare for me! - but there are some new releases coming up that I really want, plus I want to buy a couple more Cricut cartridges! I didn't list all of them today but at least I've done the photos so I can put them on when I feel like it. I got some gorgeous new stamps today - my sister finally coughed up some money she owed me so I bought a couple of sets from here! They're so cute and will look great on cards with the Magnolia Tilda and Edwin stamps. Here's another card - this stamp is one of my favourite Tilda's! Tilda in petticoats coloured in with Prisma's, Basic Grey 'Two Scoops' paper, BG 'Two Scoops' buttons and the round sentiment is by Aud. I had a rather lovely mail day today - just look what my lovely fellow S.A.D. Tash made for me! Absolutely gorgeous and just the right colours that I could pin it on my bag :) I also got my Stampin' Up order today as well so more new stamps! I got 2 stamp sets - Happy Hearts and Doodle That - along with a pack of Whisper White cardstock. Of course I had them all tidied away before H got home from work so you can't even tell that my rather small stack of SU! stamps has increased slightly! Here's today's card which I made for Grandad to say thank you for putting my scrap room together and building all my shelving! He seemed to like it so it can't be as bad as I think it is. I used Handyman Edwin coloured in with Prisma's, papers are Basic Grey 'Boxer', flowers are from a previous kit by Rebecca, the brad is from my stash and the 'thank you' stamp is Penny Black. I can't believe I'm using all my new BG so soon after buying it - if I'm not careful I'm actually going to run out of some!!! Here's tonight's card - it's Tilda with the teeny frog & colored in with Prisma's! Papers are Basic Grey Sugared and the stamp - which is one of my favourites just now! - is totally unknown, well to me anyway! I've been chasing round after the cats most of the day trying to get new photos of them for this competition - I think they're all heartily sick of me! Actually went out today - to the library! I came home with nineteen books - ooops! Off to make a start on decreasing that pile! Hurrah! Looks like I'm getting back up to speed finally - managed to make 3 cards tonight and I broke into more of my new Basic Grey :) I got my Scrapagogo Greetings kit today - lots of lovely goodies in there - and a box full of new books from Amazon. That book bit is a secret though,nobody tell H otherwise I'll be in trouble! I'm still waiting for my Cricut Expression - it cleared customs on Thursday but hasn't made it up here yet and I want to play! Here's today's card - Magnolia Tilda with heart package, coloured in with prismacolors, Basic Grey 'Gypsy' papers and flower & button from one of Rebecca's bloom kits. I think I may retake the photo in the morning - doesn't look right to me. Have entered all the cats in a competition so watch this space - we could have a famous moggy! Only three weeks now til my parents come up so fingers crossed it's only about four weeks until I get my new computer - will be nice to have this laptop in my scrap room! 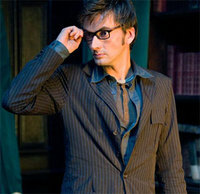 Sorry for lack of cards, David Tennant or anything vaguely interesting! I think I'll have to save up photos of stuff in future just in case my hands are this bad again! And yes, he's sat in the waste basket that normally sits under my computer desk - I'd just taken out the full bag of rubbish when he decided to jump in. Anyway, as promised, normal service is resumed! Yep, sitting here munching my Cadbury Chocolate Buttons egg - I'm very fussy and it's the only one I'll eat! Anyway, the strange weather continues - we've had brilliant sunshine and snow again, on & off nearly all day! I'm really hoping that tomorrow is good as I have my rheumatology clinic in the afternoon and it's no fun pushing a wheelchair in rain or snow. I made this card for my friend Lainey - she's mad about gardening so this Tilda was perfect! Tilda with watering can coloured in with my Prisma's, Basic Grey Phoebe papers and Banana Frog stamps! Here's today's picture of loveliness - enjoy girls! Card of the day is this one - yes, it's another Tilda! Grandad very kindly bought me the PM Retro Floral papers which I actually quite like, random bit of ribbon, bazzill and the stamp is Stamps Away - I think, I've lost the backing! Spent over 3 hours in my scrap room tonight - got a few cards made (including one for my nephew) and my Fairy Tales circle journal is completely finished except for the little bit of printing I need to do when the new cartridges arrive! I'm hoping I get a pizza box from ATDML - I ordered a load of Basic Grey Two Scoops stuff during my mad spending spree last weekend and I normally get my goodies from them within 2 days of the dispatch notice but it's yet to arrive. Still waiting for a couple of my eBay purchases too, including a book I'm desperate to read :( My post is really carp at the moment - still, it'll be like Christmas when it all turns up! Off to check the progress of the snow!!! Yep, today was the first day of Spring - usually meaning slighly lighter for longer days until the clocks change and an improvement in the weather! Obviously why there's been snow forecast over the Easter weekend & generally rubbish weather. This card is from Tuesday - before I got stuck into circle journal stuff! It's Tilda wearing the heart top, Basic Grey 'Phoebe' papers and a piece of sparkly ribbon - which you can't really see but the glitter comes off & is all over my hands and my table! - from a Little Silver Hat kit and Banana Frog Retro Greetings stamps again! Still no further progress on my Cricut after my dispatch notice :( I got a tracking number and according to that, it's still sat somewhere in Conneticut! Still waiting for my new embossing folders too, and some stamps and a new book - post at the moment is awful! None tomorrow as it's Good Friday but fingers crossed on Saturday morning there will be lots of lovely post including my new ink cartridges! It's another card! One day I might actually have something different, like a lo! Spent all afternoon helping Grandad attempt to put a new curtain track up so we can hang the new curtains and eating fruit pastilles! I love the green ones! And tonight I spent 3 hours drawing a door knocker for the inside front page of my Fairy Tales circle journal - it is rather intricate but I'm glad I did it. Right, tonights card is made with Tilda clutching some flowers (thanks to one of my SAD team mates for the image) and new Basic Grey Sugared papers (can't believe I used them the day I got them!) The card also had a sentiment on it but it's fallen off and of course I didn't notice until after I'd taken the photo! I've had a dispatch notice for my Expression so I'm hoping it might be here by the end of next week - of course I would have to order it now when we have 2 Bank Holidays over one weekend! I also received another of my stash diet blow-out purchases - more Magnolia stamps! Including Edwin's Town which is fab and huge! Both cards are made with the Tilda with bird stamp - yes, more Magnolia's! This first one is using Basic Grey Mellow papers - love Basic Grey! Got my dispatch notice so four of the five new BG collections are on the way! Ooops! The second card is made with Daisy D papers - I think they're called Lullaby? - but I'm not sure as they were cut into 6x6 squares. Broke the stash diet again today - found 3 of the Magnolia stamps I really wanted but that were out of stock just about everywhere so naturally they jumped in the shopping cart! Lol! Still not owned up about the Expression but I have had a couple of brilliant suggestions from the SAD girls about what to say when it arrives! More cards tomorrow - Nellie & Edwin! I'm trying to use all the scraps up from a rather large box full of them! This is good though as most of the time everything is just the right size for making cards. After stamping out a pile of images for the Magnolia swap I did a couple of extras & put these cards together. This first card is Farmer Tilda colored in with my Prismacolors, with a large scrap of Basic Grey Phoebe pp and a length of gorgeous velvet ric rak from another of my Little Silver Hat kits - still can't believe there's no more kits! This one is 'Love Tilda' again colored in with Prisma's, Papermania Love pp's and another LSH ribbon! Now I get to scrap or stamp every night I'm really starting to enjoy it again - makes such a difference having my own room! Last but not least, it's Old Man's birthday today - 12 years old! Not bad considering we were told he'd never make 5! Here's his birthday photo for this year - it's a bit fuzzy as he moved just as I took the picture.